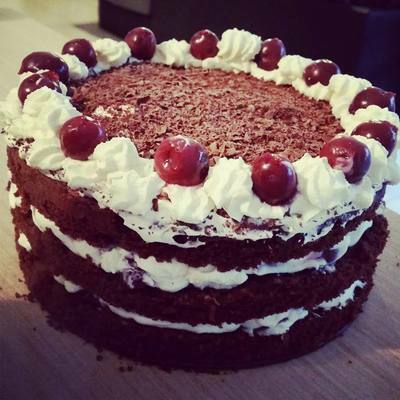 An absolutely beautiful and delicious gateau that is sure to impress any guest! 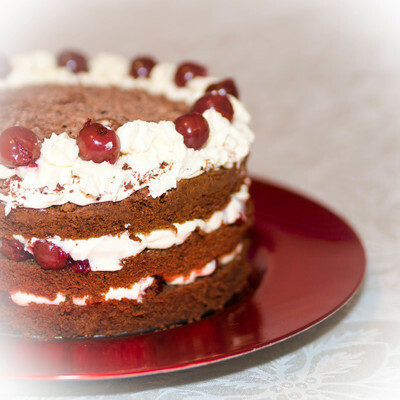 The cake itself is lovely and light and the combination of the cream, cherries and brandy syrup bring together that gorgeous black forest flavour. Don't let the presentation scare you, the elements are really easy to prepare. You just have to allow time to bring it all together. Enjoy! Begin with cake: Gently melt the chocolate in a microwave or in a heatproof bowl over a pot of simmering water. (Don’t let the bottom of bowl touch the water). In a bowl, combine the melted chocolate with the soft butter and beat until creamy and smooth. Slowly and gradually beat in the sugar and egg yolks (adding one at a time). Beat the egg whites until stiff with a pinch of salt and very gently fold through the mixture. Pour into a lined and greased spring-form tin cake tin. Mine was 23cm. Bake for 40-50 minutes or until a skewer comes out clean. Remove from oven and allow to cool completely before removing from tin. Meanwhile, make cherry mixture. Drain morello cherries, reserving juice and put 10 cherries aside for decoration or use fresh if you have them. Combine remaining cherries, 2/3 cup of reserved juice, caster sugar and cornflour in a saucepan and simmer over medium-low heat, stirring constantly until mixture thickens (about 6 minutes). Remove from heat and place in a bowl. Cover with gladwrap and put it in the fridge to cool. Make syrup by combining all ingredients in to a jug and stir until sugar dissolves. Whip cream with 1 tsp of vanilla essence until nice and thick. 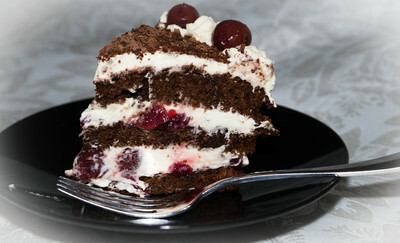 Cut cake in to three even layers. Put base layer on serving plate. Drizzle half of the syrup over base layer, followed by half of the cherry mixture and a layer of cream. 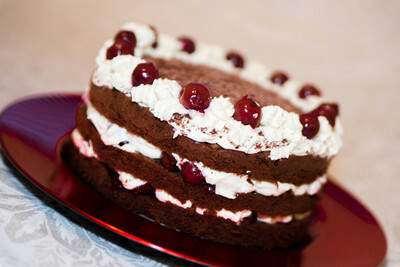 Repeat with the second layer of cake , syrup, cherry mixture, cream and finish with the top layer of the cake. Smooth over a layer of cream on the top layer of the cake. Sprinkle over grated chocolate. Using a piping bag with a fluted nozzle, pipe rosettes around the edge of the cake. Place reserved cherries inbetween the rosettes and serve.